The intersection of North Seven Hills Road at State Street is located in a high growth area of O’Fallon. The original intersection was stop controlled on all four approaches. During peak hours, the intersection frequently became congested and traffic backed up in each direction. 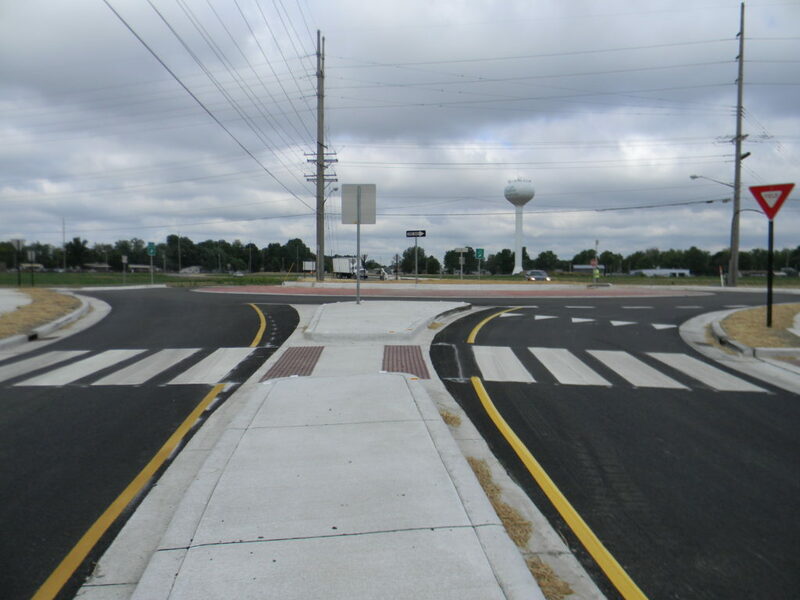 The proposed solution was a single-lane, modern roundabout that included new full-depth asphalt pavement, concrete curb and gutter, sidewalks and drainage improvements. The addition of sidewalks along each quadrant of the intersection accommodates pedestrians and bicyclists. Pedestrian safety is enhanced by the raised median splitter islands that allow pedestrians to cross one lane at a time. Our work scope included topographic and property surveys; an intersection design study; a project development report; roadway and drainage design; construction plans, specifications and estimates; construction staking; and right of way documents and negotiations. A minor amount of additional right of way was needed on all four quadrants of the intersection. The project was financed with federal Congestion Mitigation and Air Quality (CMAQ) funds.